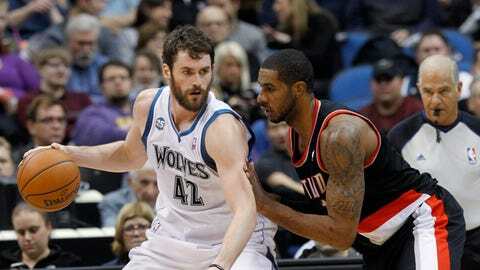 Timberwolves forward Kevin Love (42) worked against Portland forward LaMarcus Aldridge during the first quarter Wednesday night. "I think it’s important for us to keep leads and hold off leads and not always be fighting from behind," said Kevin Love, who finished an assist short of his first career triple-double with 29 points, 15 rebounds and nine helpers. Said Nikola Pekovic, who muscled his way to 30 points for the third time in his career: "We just got to respond. … We knew the best team in the NBA’s coming." "You’re trying to get your team to see the validation of when they play the way they’re capable of playing," said coach Rick Adelman, whose team has played seven back-to-backs like the one Portland wrapped up Wednesday. "We know, I know, our players know this is (the Blazers’) fourth game in five nights, but that’s happened to us, too. "You can go out there and play well, and if you open the door a little bit against a really good team, they’re gonna barge through. That’s what we have to understand. We can’t open the door." "It’s big," said Barea, who scored 10 points and finished in double figures for the third night in a row. "Any time you beat a time like that, it’s big." "I hope it does come," Love said. "I did think I was looking at it right in the face tonight, but it didn’t happen for me. The guys kept saying, ‘Just get one more (assist).’ I said, ‘let’s get a win. How about that?’"
Blazers coach Terry Stotts called Aldridge the best four in the game today, "with all due respect to Love," before Wednesday’s contest. Love wasn’t confrontational about it afterward, but his performance on this particular night said otherwise. "His coach is supposed to say that, and our coach is supposed to say that about me," Love said. "He’s a tremendous player, and I’ve got to tip my hat to him, because he’s really worked on his game." "They got hot," Martin said. "We stayed with it and finished it up."